Super Junior (Korean: 슈퍼주니어), often referred to as SJ or SuJu (슈주), is a boy band from Seoul South Korea that was formed under SM Korea's largest producer of pop music. Super Junior debuted in November of 2005. Super Junior has 13 members Leeteuk (the leader), Heechul, Han Geng, Yesung, Kang-in, Shindong, Sungmin, Eunhyuk, Donghae, Siwon, Ryeowook, Kibum, and later, Kyuhyun. The Chinese member, Han Geng, was chosen from three thousand applicants, via auditions held in China by SM Entertainment in 2001. Super Junior has released and contributed in 19 different kinds of records with varying degrees of success. Over the years, they have been divided into smaller sub groups, simultaneously targeting different music industries and audiences. Largely due to Super Junior's success as entertainers, other Korean entertainment managements began to train their music groups in other areas of entertainment, such as acting and hosting. In addition to their commercial success, Super Junior has earned four music awards from the M.NET/KM Music Festival, another four from the Golden Disk Awards, and is the second singing group to win Favorite Artist Korea at the MTV Asia Awards after JTL in 2003. SUPER FRESH AND SUPER HOT!!! First Appearance: 2000 MBC "All About Eve"
First Appearance: February 2005 KBS "Banolim 2"
First Appearance: May 2002, SBS "A Man And A Woman"
First Appearance: August 2005, MBC "Sea of sisters"
First Appearance: October 2003, Dana MV "What is Love"
First Appearance: "New Single Jacket Photoshoot" news on television. Super Junior - K.R.Y, established in November 2006, is a trio consisting of Kyuhyun, Ryeowook, and Yesung. Because of their vocal strength, the company decided to bring them together as a group making them the first subgroup to spring out from the whole of Super Junior. Super Junior - K.R.Y targeted a more mature audience through their powerful ballads mixed with a hint of R&B. Though they have not released an official album as a group they performed in some of the most popular Drama OSTs. Super Junior-Trot, officially known as Super Junior-T is the second official subgroup from Super Junior, established in February 2007. Super Junior -T's music style is a distinctive style of trot, an old-fashioned style of Korean pop music. Their revised style of the genre includes mordernized K-pop melodies and also fast rap, usually performed by Shindong, Eunhyuk, and sometimes Heechul. Super Junior-T's goal is to evade the fading genre in Korea's current music industry and to introduce the young audience to a traditional style of music, hoping to increase awareness of older trot musicians and bring hopeful comebacks of trot to mainstream music. Emergence of Super Junior-T is also due to a strategy that Super Junior has been using, which is to show that they can accommodate many different musical genres. 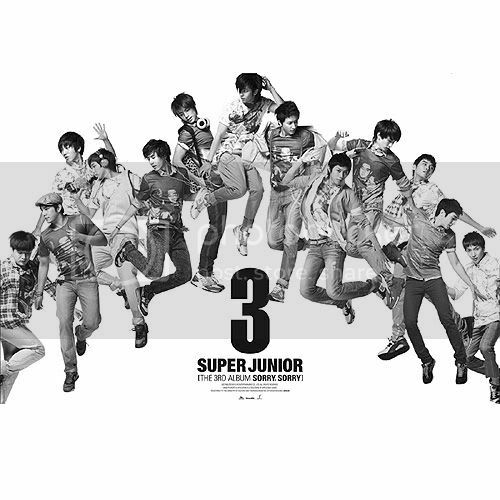 On November 5, 2008, Super Junior-T re-released "Rokkugo", now titled "ROCK&GO," in Japan. Presenting this project to the Japanese comedy duo Moeyan, who are skilled in combining comedy with song and dance, Super Junior-T hopes that the duo will help them localize the single into Japanese. The collaboration was the duo's official debut as singers and Super Junior-T's entrance in the Japanese market. The single debuted at #19 on the Oricon Daily Charts and jumped to #2 three days later. Super Junior-T and Moeyan held two mini concerts on the same release date as the single in the C.C. Lemon Hall at Tokyo to promote the record. Super Junior - M, often referred to as SJ-M, is the third official subgroup from Super Junior established in April 2008. They are the first international music group in the Chinese music industry to have members of both Chinese and Korean descent. They are also the first group produced by Korea's CT (Culture Technology) organization and was created through a comprehensive localization strategy. Super Junior - M's goal is to bring the Korean pop influence over to the Chinese market, re-representing the hits in Mandarin. Similar to the style of their main group Super Junior, Super Junior-M's music style falls into the category of mainstream pop, dance, and R&B. Dance pop songs with rock and hip hop influences are easily heard in their music, such as in "Me" and "The Moment", which contains guitar riffs and heavy bass sounds. Rap is not performed as often like the main group, but these influences can be heard in "The Moment" and also the rap remakes in "Don't Don" and "A Man In Love". Super Junior - M "Me"
Super Junior-Happy , sometimes referred to as SJ-Happy or Suju-Happy, is the fourth official subgroup from Super Junior established in June 2008. Super Junior-Happy's music style involves the common style of contemporary dance music and bubblegum pop, mainly targeting the music industry with their fun and entertaining style. Super Junior-Happy's debut single, "Cooking? Cooking!" is a dance track with refreshing rhythm and quirky lyrics. Their goal is to give fans feelings of bliss and happiness with their music.